Expensive but who doesn't like a little bling? I've labeled the pictures for searching purposes. Here's a table with some interesting numbers from our year. Perhaps the most surprising number that popped out as we compiled this list is the number of hours run. Liz had a total of 979.5 hours of running in 2012! That's a half time job and that's just time on her feet. I also had a goodly number at 751 hours and 47 minutes. For the non-runners out there bonus miles are miles run while off course in a race. I only got bonus miles at Doubletop but Liz is greedy and took bonus miles at a number of races. - For the total miles we didn't do the research for exact miles per race. We just took our total finishes x 100 then added bonus miles plus 18 for Liz's LOST 118 race and I added my DNF miles in. - The number of airline flights is accurate within 5 or so flights. Again we didn't do the extensive research but looked at our completed flights on our Airtran acct and added in the extras on other airlines. - Mike Dobies sent a funny link to a google map with a driving route with our approximate total mileage between us. You can see it here. - The Coury brothers comped our Javelina entry. Thank you guys! - Buckle photos will be up soon. Here's a table with every week of the year, races run and times. ** = 10th consecutive finish at Leadville! This race which took place on 29 December popped up sometime in October or November and fit perfectly into our schedule as a final flat and easy 100 mile course that was manageable (a 2 mile loop) and in a major urban area where Airtran flies (Houston). We barely hesitated in signing up for the run and after having run the race we couldn't be more pleased with the organization, course, and logistics of the event. We flew into Houston on Friday and flew home on Monday as the flights were much cheaper than on Sunday. We had decided to splurge a bit and get a more upscale room for Sunday night but with some internet sleuthing Liz found a room at a Hyatt Place for less than $70 which had an awesome hot breakfast and was very comfy. They even let us check in at noon! As we were driving to the airport on Friday morning we were reminiscing about the year and I mentioned how we had done remarkably well in only missing one flight the whole year when we overslept for our flight to Kansas for Heartland. I mentioned that I was glad that this would be the last time I had to drive to the airport for a while and so on. Well, when we got to the off airport parking place we use we got out of the car to load our luggage on the shuttle and Liz exclaims "Where's my suitcase!?" Crap. She had left her bag on the deck by one door and then left the house by another door and forgot to grab it. With a quick call to Airtran we made arrangements for a flight later in the day and drove the 80 miles back home and then back to the airport. Still, only two flights missed is pretty good, don't you think? Once in Houston we checked into our room and drove to the race start as we usually do so we know where to go in the morning. Then we got a bite to eat and were asleep by 10 or so. We slept well, barely bothered by the freeway thundering by 200 feet away and woke up ready to get this last race done. I have to share a secret we have used for a good part of the year to get to sleep the night before a race. What we do is take a dose of Nyquil which knocks us out and usually we sleep through to our alarms. I suppose it helps that any pre race jitters which might wake us early had left us many runs ago! We drove to the start and grabbed our goodie bag with bibs as well as our timing chips and pretty much holed up in the car as the temp was around freezing and there was a stiff northerly wind blowing. Here's a pic of the aid tent and the beautiful sunrise. The course was a flat asphalt bike path around a bunch of soccer fields and baseball fields. It had some straight bits and one section that snaked back and forth a bit but no really tight turns. It was funny how the course seemed completely flat early but by the end of the race the short slight inclines (we're talking 8 inch rise over 30 feet) were very noticeable! That said, this course is very fast. 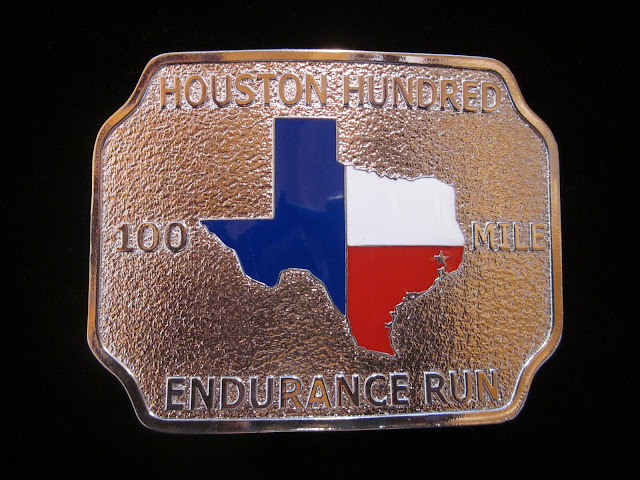 It would be a great first time 100 miler with such a short loop, great aid, chip timing so you don't have to worry about catching someone's attention each lap, and a high likelihood of good weather. We had cold temps and a 10 mph or so N wind during the day but short of rain this is probably as bad as it would get. I meant to carry the camera around a loop but never got around to doing it. With this being the last race of the year I had decided to push for as fast a time as I could since there were no more races to be put in jeapordy. I did the first few laps running with Shannon McGinn at right around a 10 minute pace. Then after a few laps she stopped at her car and I continued on staying pretty steady for a good bit. Those first few laps I was eating and drinking very little usually passing by the aid table without stopping. As the day wore on it continued to be quite cold running north into the wind but got nice and warm on the long straight section heading south to the aid station. I kept a good pace and had visions of a sub 20 hour finish if I could stay strong. I believe my 50 mile split was about 9:17 while I was hoping for around 9 hours. Eventually it became obvious that sub 20 wasn't going to happen and I thought about backing off and taking it easy but decided to tough it out and keep pushing with this being the last race in such a big year. Crossing the finish line in 20:19 was sweet. I got to run with several different people as the path was wide enough to run side by side easily and chat. Getting to know race winner Jeremy Blackford a bit better and local runner Trent McKenna was fun. At one point when I was starting my second to last lap I fell in with Jim Kern and he said that he wasn't sure if he had 2 or 3 laps to go. At this point I was in second place and I wasn't going to lose that position easily. I had visions of a push to the finish. As we ran along chatting I noticed that Jim was slowly increasing the pace and I matched him with some effort but no real strain. Eventually we were running what I would guess was about an 11 min/mile pace. I was still able to chat without being out of breath and after a little over a mile of this Jim started to fade back. I was able to continue on until I had a comfortable gap and eventually I wasn't even able to see him behind me. After I finished and he came by it turned out that he had another lap to go anyway. It was fun to race at least a little bit! I had passed Liz a number of times so I knew that she would be a while finishing. I sat in the aid tent chatting and sitting next to the kerosene heater but eventually started to chill so I went to the car and changed clothes and warmed up the car. It was well below freezing by now and I kept the car running dozing, shifting in my seat from sore muscles, and drinking bottles of gatorade. I had a time estimate when I thought Liz would finish and though it was still early I noticed her coming to the timing mat and got out of the car to see how she was doing. It turned out she had pushed the last couple of laps and this was her finish in a nice 22:26. And so it was done. What a year. Here is a picture after the race with RD Yen Nguyen the sweetest RD ever. Yen and her crew were fantastic. They were there in the cold all through the night and always had smiles on their faces. The aid station food was your basic fare but there was pizza at dusk, grilled cheese, ham, quesadillas, and an array of drinks with a cup or two always poured and ready. Thank you so much Yen and all the others for making this end of the year run a special one! 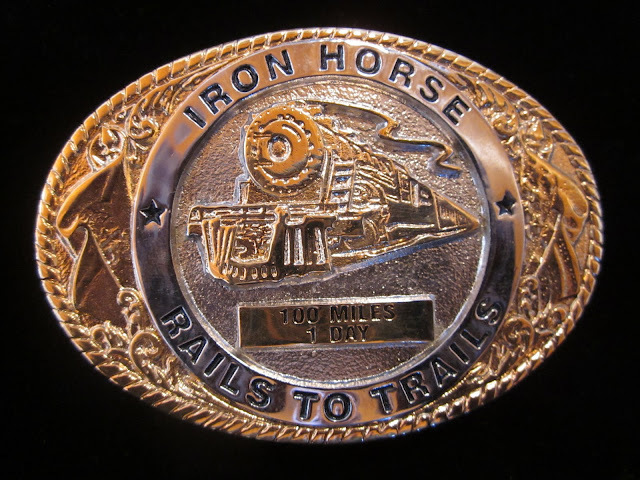 The Pony Express 100 was run on Friday Oct 19th. I only had 5 days of rest from the Heartland 100, where I had run a sub 24 so I was expecting to pay the price of a hard run. The historic Pony express trail is where young men once rode horses to carry mail from Missouri to California in the unprecedented time of only 10 days. The race course follows a portion of the actual trail located in remote western Utah. It is 100% dirt road with a good bit of gravel thrown in. There is not much climb, only about 3,000 feet. We ran 58.2 miles out, turned around and retraced the route back. Crew is required as water is limited to the two manned aid stations. A running friend Elise Harrington who is also an accomplished adventure racer, with many races from around the world, agreed to crew me. We both flew in to Salt Lake City. I had brought the GPS to assure we wouldn't get lost. Well, lets describe it like this... we ended up taking a 2 hour tour around salt Lake city, first arriving at a the end of a subdivision circle where the houses had not even been built yet. Second go round brought us south of the city to the driveway of a horse farm! go figure. By now it was 6pm and I was wanting to find the race start. Finally, at 8pm we found the race start and race director Davy Crockett. The starts are staggered to minimize dust on the road from crews. I was in the 7am start, I needed the extra hour of sleep. The start was a nice rolling downhill which tricked me into thinking my legs were going to be OK. at the bottom the road stretched out straight as far as the eye could see. I am not a big fan of flat running but, I knew my tendon I would be better off. At this point I was thinking to my self how much I would love to see some wild horses. With in 5 minutes, about a half a mile to the North....there they were in all their glory. Every color represented....grey, bay, cream, black and brown. The stallion was obviously the grey! Wow.....this was an incredible sight, one I will cherish forever. I looked off to the distant mountains and felt very alive and focused on those mountains and about 20 miles later I was climbing over them. The grade up was runnable, I power walked and shuffled this. On the backside was a long downhill where I rolled right along passing a few people. The weather was perfect. Crews would pass, I would see Elise every 4 miles or so and there was a lot of camaraderie, everyone drove slowly keeping dust to a minimum. I felt good until about 60 miles at this time hot spots were forming on my feet and worst yet, the tendinitis of my left foot flexor tendon was flaring up. I stopped briefly changing shoes and socks and retaping my feet. Ten minutes later, the different socks were aggravating the tendon. I knew to stop and try different socks, the cuff around the ankle was too tight and any pressure on the tendon would result in terrible inflammation. As the long night approached I grew tired and my legs were dead. I resorted to a power walk shuffle on and off, I was slower now and stops for Elise grew closer. By 2am I had asked her to only go a mile. I was so mentally and physically beat that I needed to see those tail lights. And that's what I did for the rest of the race......run to the lights. I did have a high spot upon reaching the big return climb. I ran down fast and keep the roll going for a least 5 miles, I believe those were my fastest miles of the race. Running strong at 80 miles is very invigorating and gives one a big boost. at this point, looking at my watch, I realized a sub 24 could happen if I pushed, so, I ran. We were on target until I thought were 3 miles from the finish when in fact we were 6. A big disappointment, but I gave it my best finished in 24:23 6th overall. 27 starters, 14 finishers. This is a fast course, totally runnable, but, you must prepare yourself for the long, straight stretches. However, the immense open spaces were so beautiful with the mountains pared up against the crystal blue sky! I cannot thank Elise enough for her endless energy and ability to go without sleep to crew me. I can only imagine how difficult it must be to drive one mile stop, crew and repeat. this was truly a team effort. Elise and I stayed at the finish to watch some of the other runners come in. Elise then drove us to the airport. We didn't get lost this time! I found a great inexpensive room in Steeleville in a old remolded Grey Hound bus station. We started at 6 am in the dark, Unfortunately, We all took a wrong turn and climbed a mile before realizing our mistake. The rest of the course was extremely well marked, no getting lost here. The first 5 miles were very rocky and technical, my ankle felt fine, so I started really rolling on the downhills. (big mistake) by 6 miles I was beginning to have an altered gait, favoring my left ankle. Also, at about this time the rain started to fall. The temps were mild, so the weather was not an issue. The course is very rolling, climbs are not steep or long, but, they do not let up. There is 10,000 feet of climb on the course. However, if you are not injured and rested, the course is completely runnable. There are several stream crossings, at which I was able to stop, negotiate and rock hop and stay relatively dry. However, as the day went on the mud grew slicker and thicker. The aid stations were top notch with hot food, and lots of it. They were all fully maned, with extremely attentive volunteers, most of which were Ultra runners themselves. The stations are located about every five miles, and the course is a 25 mile loop we would repeat 4 times. By the end of my first loop I knew I was in trouble....the pain in the tendon, ankle area was bad. By the start of the second loop, even shuffling downhills was impossible, I was having to "crab" walk the downhills, just as I had done in the latter miles of Hallucination 100. I could still climb strong, so I tried to make up for the slow downs this way. When there was a flat section I shuffled this. In fact , I discovered a new ultra running gait "the scuffle" not as fast as the shuffle, but more efficient than the power walk, which I was unable to perform because of the injury. Finishing lap 2, I was really feeling the effects of running injured, my right side, the uninjured side was beginning to tweak and bark. This was going to be hard..... I told my self..".Remember... there are no bad finishes, you have plenty of time" so, endure is what I did. By the third lap I was limping noticeably. Into the night the rain continued on and , my feet were wet and blistered. I had taped over blisters from last weekend. The pain in the ankle and tendon over rode the blister pain. I ran alone for all of the race, people would pass on occasion, otherwise it was a lonely time where hours upon hours of dealing with the pain was all consuming. During this 3rd lap, I stopped to retape my feet. I recall 4 or 5 runners in chairs all with the "I'm done 100 mile stare" As I pulled my socks off, wet, stuck to the tape which in turn was stuck to my skin....sometimes you just do what you have to do. Luckily for me it was late at night 3am, so, my sh*!t and other foul language was par for the course. A kind volunteer came over during all this, starting asking questions, "What can I get for you? what do you need? are you ok? " etc. I barked back loudly "NO more questions!!" I was left alone to deal with my foot pain and taping task. Soon up on my feet again, with a "new set of tires" I was off into the night. Eventually, the sun rose. 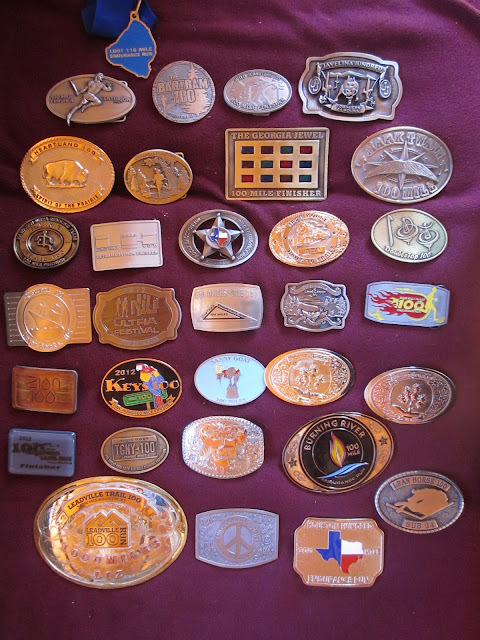 I recall coming into an aid station, standing bewildered looking at the table and leaning forward grabbing on to the table with both hands exclaiming " I just had to stop the table from moving"....stated with the utmost sincerity. Very casually, the volunteer said "You are not the first person who has done that" I was Hallucinating badly! As I approached the end of my 4 th loop, I felt the endorphins kick in and I shuffled, scuffled to the finish to break 31 hours (30:59) Post race was full of great food and stories from other runners. Only 4 runners went sub 24 and no females finished under 24. This is not a easy race, certainly not difficult, but, I will place it in the challenging category. 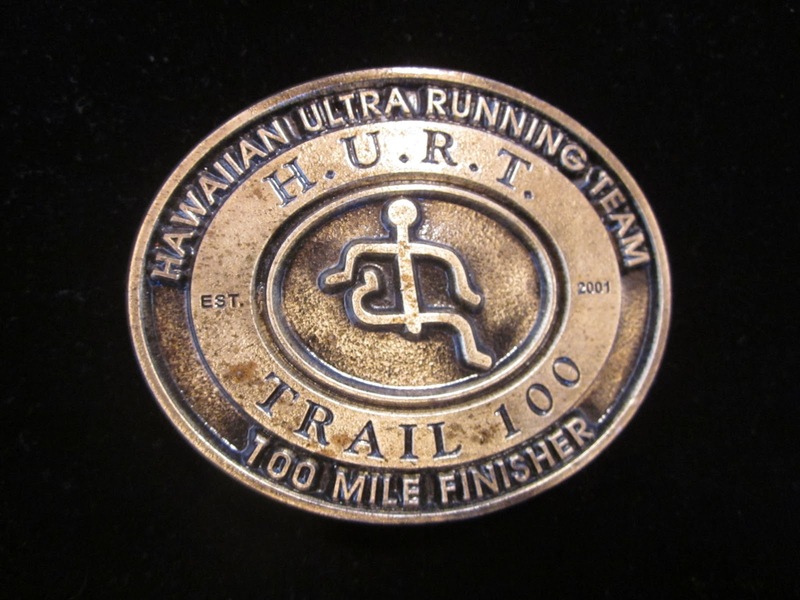 To run 100 miles on single track trail is truly a challenge to be met. 100 miles over single track in one day (24hours)....Now..that's something to talk about. If you are a lover of technical trail, single track and can handle rocks and roots and love a challenge...This is the race for you. the aid, support, and directors of this race, Tommy Doias and Travis Liles get a thumbs up A plus on a race well done. Early yesterday morning (29 Dec) Liz and I both finished the Houston 100. This was Liz's 36th 100 miler in the calendar year 2012, and it was my 27th. We did it and it is now done! We both pushed hard on this one and following a sub-24 hour performance two weeks ago we both did a repeat sub-24 with Liz finishing in 22:26 and myself in 20:19. As we sit here in our hotel room we are sore, stiff and happy to be finished. Liz has 3 or so reports that we will be posting soon. I will write up the Houston report later this week. And look for a "year in numbers post" which should be fun. It's been an exciting year. We've pushed our bodies and our minds to places that we've never gone before and met so many wonderful and interesting people. This has been a year to remember but definitely not one to repeat. For anyone who wishes to challenge the record, best of luck but be prepared for the challenge of your life! Sunrise at the start of the Houston 100 - a great omen for a great race to end the year.